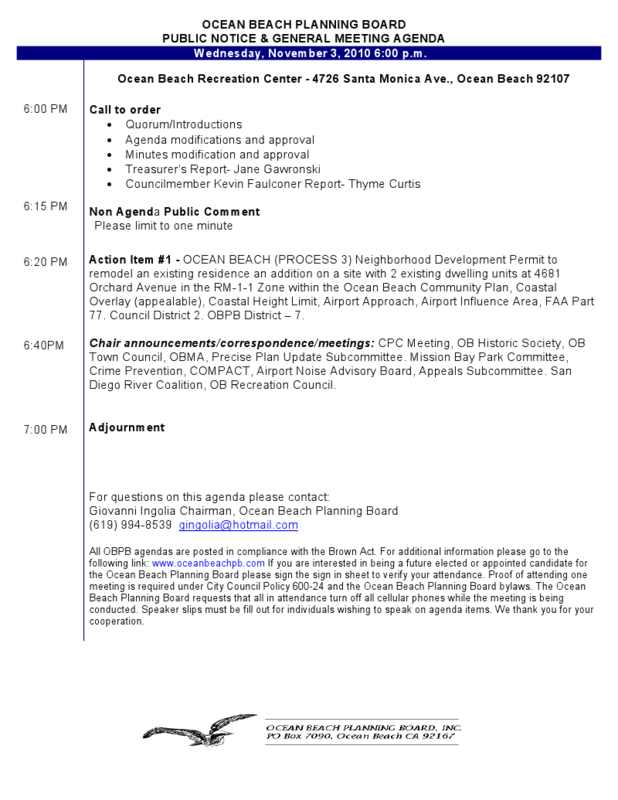 Here below is the Agenda for Wednesday night’s OB Planning Board – November 3rd, 2010. The one action item on their agenda is a Neighborhood Development Permit to remodel an existing residence at 4681 Orchard Avenue. The residence is an addition on a site with two existing dwelling units. The meeting begins at 6pm at the OB Rec Center, 4726 Santa Monica. Older Article: OB Rag and CityBeat Live Blog Coverage of Elections – No more politicians, pundits, or plutocrats – It’s just the rest of us – so VOTE! Newer Article: Is the City about to cut down a Torrey Pines tree on Long Branch?